You are invited to a Gin Tasting at BYC! 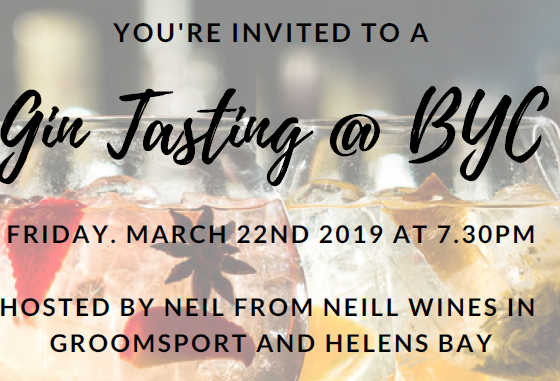 A variety of boutique gins, special tonics and accompaniments will be put forward, all with background and suggestions from Neil. Neil has been involved in the hospitality industry for nearly 30 years. His passion has always been wine but about 3 and a half years ago a gin revolution took place and his life has been a gin tasting ever since. You will get to taste all the gins neat and then take them on a journey with bespoke garnishes and mixers. It is a relaxed interactive evening and primarily very good fun. So, come along, bring a friend and enjoy an educational evening at BYC. Tickets priced at £20 each and can be booked online.